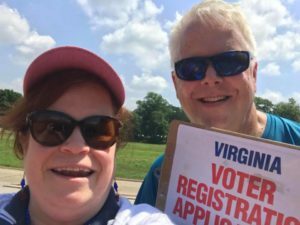 The Mount Vernon District Democratic Committee has many volunteer opportunities, including standing committees that host events and fundraisers, reach out to the community, and help elect Democrats. There are also many opportunities in the months leading up to Election Day each year. Contact us to learn more about our committees. Specific volunteer needs will be listed below when available. 500 students AND their parents are expected to come to the Teen Job Fair at Mt Vernon High School, Saturday, April 27. Volunteers are needed to offer FCDC summer internships and volunteer opportunities, and to help students register to vote! Click here to sign up.